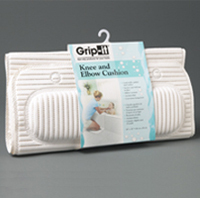 Grip-it Knee & Elbow Cushion helps ease pressure on knees and elbows with a comfortable, padded vinyl surface. Suction cups hold cushion in place. Mildew-resistant and antimicrobial to help prevent mildew.